What In Hell… Is Going On? Jesus or Barabbas – Which “Son of the Father” Are We Following? The cyclical nature of human events still amazes me. The more things change, the more they remain the same. About 2000 years ago the Roman government gave the religious leaders in Jerusalem a choice between two men; Jesus or Barabbas. The Romans gave the Jews this choice because of a custom of releasing a prisoner every year around Passover to appease the Jews in an effort to keep the peace. The choice between these two men came about because Jesus’ ministry was upsetting the status quo in this Roman province of Palestine. He was changing people’s hearts and therefore was changing the accepted order of things. No imperialistic power allows this for long. The religious leaders were afraid this intenerate minister was going to shake things up so much that it would cause them to lose their place of social status. Pilate, the Roman governor, was giving the people of God a choice that would determine the philosophical direction they and their nation would go. Here in Sanford Florida, in the wake of the Trayvon Martin tragedy I have challenged both white and black leaders with this very question. “Are we going to follow the way of Barabbas or Jesus?” Will we try to resolve the racial conflict in our city by the strength of our flesh or by the Spirit of God? One way prolongs the division the other resolves it. Everyone knows Jesus is the son of the Father, but did you know that Barabbas’ name ironically also means “son of father” (bar=son and abbas=father)? Here we see again how multilayered and insightful the Bible is as it illustrates the two natures we humans must choose from today. The struggle of the ages ironically isn’t about what is happening outside of us but with what is happening inside of us. Choices are a central theme in the Bible. The Holy Scriptures highlights several scenarios where we have an opportunity to choose between good and evil, right and wrong and Spirit and flesh. There are choices between the Two Trees in the Garden, Cain and Abel, Isaac and Ishmael, Jacob and Esau, David and Saul. Each of these choices illustrate this inward struggle we all face. (For more insight on this see Where God Speaks About Everything). Barabbas was already in the custody of the Roman authorities for murder and insurrection (Mark 15:6; Matthew 27:15; and John 18:39). It’s not difficult to understand why Barabbas was responding the way he was. From a little boy he probably saw members of his family and friends suffering under the forced labor and taxation of a foreign nation. How much pain and humiliation had he experienced from the hands of these invaders? How many friends did he see crucified? It seems he was unwilling to sit back and do nothing while another “lynching” took place. He was going to fight these oppressors. The anger and bitterness he felt was justified. In the end he ended up in jail awaiting crucifixion. Today we might see Barabbas in a right wing militia or in a Black Panther group. Sometimes you can see Barabbas in the Civil Rights movement or on Talk Radio. The Cable News shows give air time to Barabbas as political operatives. I think we all would agree we see Barabbas in the Islamic terrorist. When we choose Barabbas we get a short term rush from a sense of accomplishment. Our prideful, flesh/nature craves this kind of instant gratification. It gives us a small sense of control in a world where we seem out of control. However a “Barabbas spirit” results in us planting seeds that continue the war perpetually. It’s not that there isn’t a time to fight a just cause; it’s just very important we monitor what’s going on in our hearts while we do it. Jesus taught us to beware of a root of bitterness because it defiles many. When we harbor bitterness, unforgiveness and revenge in our hearts it’s like drinking poison but expecting the other guy to die. It affects every relationship we have. Jesus told two of His disciples who wanted to take action like Barabbas in Luke 9:55, 56; that they didn’t know what “spirit” they are of. The Lord doesn’t want us becoming the enemy while fighting the enemy. I like what Dr. Martin Luther King Jr. said during his “I have a dream speech” 50 years ago this month. “But there is something that I must say to my people who stand on the warm threshold which leads into the palace of justice. In the process of gaining our rightful place we must not be guilty of wrongful deeds. Let us not seek to satisfy our thirst for freedom by drinking from the cup of bitterness and hatred”. 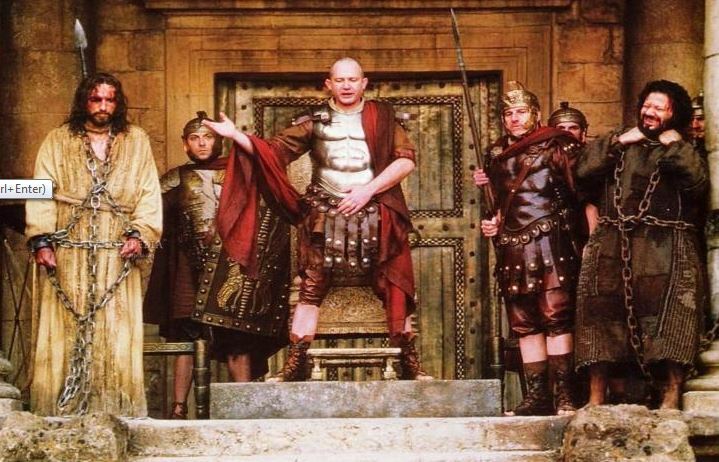 Our Religious Leaders – Some of our religious leaders still chose “Barabbas” today. They may have “reverend” in front of their name but they are not operating in the spirit of a peacemaker involved in the ministry of reconciliation. In fact they seem to relish the thought of stirring things up and instead of calming the situation down. It is a shame, but it is evident that these “spiritual leaders” haven’t experienced a genuine personal transformation that comes from an intimate encounter with Jesus Christ. Their serial combativeness and self-interests betrays their true condition and their real agenda as they agitate the very disputes they claim to want to solve. This is when snake catchers sadly turn into snake breeders (For more information see our article “Keeping The Snakes Alive” ). Our Corporations – The executives and producers of our television news networks and talk shows choose “Barabbas” by inviting him on their programs. The fireworks and heated rhetoric he uses raises their ratings and their revenues. These business leaders seem more focused on their company’s stock prices than meaningful solutions. Our Politicians – Some of our political professionals never waste a political or a racial crisis as an opportunity to seek out a camera; not to foster dialogue in order to find solutions, but to advance their self interests. Since their power comes from the consent of a particular constituency they often don’t seek heaven’s point of view. We The People – Let’s be honest. None of this happens in a vacuum. We as a nation often chose “Barabbas” each time we participate in the argumentative mudslinging as we watch television, as we talk to those at the water cooler at work, or with our family around the dinner table. We love the propaganda each sides spews forth and the drama it produces. We are like the people who go to hockey games for the fights. We are not unlike the crowds in Jesus’s day voting for the guy who looks more capable of busting some Roman heads. How many of us are working to advance the conversation towards heavenly solutions by doing things Jesus’ way? When we chose to die to the “Barabbas way” of doing things and yield to the life of Jesus Christ, new life and new solutions emerge from another realm. What seemed like an impossible situation or conflict becomes an opportunity for the “Way-maker” to make a way through us. New relationships and perspectives develop between different groups of people as we submit to Him, not our entrenched ideological camps. Choosing Jesus is not easy to do, especially if you live in a world like Barabbas did; where a dominate culture oppresses and withholds justice. There is a price to letting the Spirit of Christ rule the day in our lives. Just seeing Jesus suspended between heaven and earth testifies to the price of being part of the solution. The feeling of being alone in this process is often unavoidable. If you feel alone you may also be experiencing “The 3 Difficulties of Being From the Future”. You may get shot at by both sides of an issue; Jesus did. Ironically a godless empire conspired with right-wing fundamentalists to get rid of the greatest human who ever lived. Yet Jesus overthrew the empires of Rome and Religion; better yet He also overthrew the satanic strongholds in the human heart that causes these oppressive institutions in the first place. Even Gandhi following the teachings of Jesus from the Sermon on the Mount overthrew the greatest empire of his day. It may not seem like you are accomplishing much when you choose the way of Jesus. It may seem like things are moving like a herd of turtles. However every time we choose Jesus we win. Victory is guaranteed. Regardless how it feels, the way of Jesus is actually the short-cut to fixing everything that needs fixing. I choose Jesus. I hope you will too. Posted in Most Popular Articles and tagged Barabbas, Conflict Resolution, Conservative, Jeff Krall, Leadership, Liberal, Political Power, Race Relations, The Way of Jesus, Trayvon Martin on August 10, 2013 by Jeff Krall. ← Does Everyone Need to Attend Roadkill Seminary? Why Does it Seem like God is Hiding from Us? Does Everyone Need to Attend Roadkill Seminary? Organization VS Organism – What is the Church? Do You Offer Your Skill or Your Soul to the Lord? Why Does it Feel Like Jesus is Walking Past Me? Who Does God Want Me to Vote For?